"I could win a Grand Slam one day"
Ági Szávay returns to competition in March, after an almost 6-month-long injury break. The 22-year-old player told MTI (Hungarian News Agency Corp.) that last year she sometimes competed with unbearable pain, but she and her new coach, Gábor Köves believe she can rise again. She believes it’s not impossible that she wins a Grand Slam once, which is the dream of all tennis players. Ági krijgt verzorging bij haar rugblessure in New Haven (2007). "Last year, I was actually competing with painkillers and all kinds of tapes all over my body, but back then we didn’t know how serious the injury was” - said 22-year-old Ági. “As a result, my stomach was ruined by the medications and the injury just became worse and worse. I’m talking about my back. I used to have a spinal disc herniation earlier, but it is ok now. My current problem is that I have a slipped disc in the lumbar area and it causes a lot of problems. ” Ági said that she hasn’t read the autobiography of André Agassi yet, but she was told that he wrote about having the same problems: lying on the floor paralysed by the injury in his back, howling from the pain. “Unfortunately I know what he means, actually I know it too well. I haven’t read the book yet, but it’s the next one on my list, I’ll have plenty of time to read it during the long airplane flights. ” Agassi wrote in his book that he hates tennis - does Ági Szávay have the same opinion? “Love and hate are very close to each other. Surely there are moments when one feels the same that Agassi wrote, but you can’t be successful if you have hate in your heart toward the things you do.” The highest-ranked Hungarian player withdrew from Fed Cup two days before leaving for the tournament. Earlier she stated that Fed Cup would be her first tournament and a start of the season for her. “Yes, that was the plan” - said Ági. “I was testing my back in test-match situations to see if and how soon it starts to hurt. One week before Fed Cup I knew I wanted to be there no matter what. I tried to strengthen my back and worked hard on it. Three days before departure I played a test match. I could only play six games before it started to hurt. It was very hard to make the decision that I’m not going to Israel and I felt very uncomfortable making it. But if I can’t play a single set without pain, how would I be able to play a whole match?” A few days later she withrew from the tournament in Paris, where last year she reached the quarterfinals. “I withdrew because I knew that my condition is not going to improve enough in a week to play the tournament. With that withdrawal I have another 1.5 months to heal and my ranking will not drop too much. My first tournament will be Indian Wells at the beginning of March. I’m trying my best to be pain-free by then. It’s a good tournament because it’s big and there is a 64-player main draw. It means that I won’t get a seed in the first round because they have a bye in the opening round.” A few years earlier, when she finished her junior years and turned pro, Ági was very fit and full of strength. Her fitness was one of the best an athlete can have. “Yes, it’s true. But then in 2006 I had mononucleosis, which is a serious illness and it weakened my immune system” - explained Ági. “Since then I’ve never been that fit again. When I had my breakthrough in 2007, I already had this back injury that I have now. Of course I had many ups and downs since then. At the moment my goal is to get back to that level, and I’m positive that it will happen, I get a lot of treatment for my back. I went to the doctor’s with it earlier as well, but I didn’t take it seriously enough. Now I have physiotherapy every day and I have a great team helping me. I believe I’m finally in good hands. Ági met ingetapte dijen in Praag (2010). ”The Hungarian player played her last match of 2010 in October in Beijing, losing in the first round of the $4.5 million tournament to Russian Elena Vesnina in three sets. Later she switched coaches, she parted ways with her Austrian coach, Karl-Heinz Wetter and is now working with Gábor Köves, the former Davis Cup player. “I’m really enjoying the practices, he can always cheer me up, even at the most difficult times. He is the kind of person that does everything so that I can make the best of myself and profit the most of the practices. I learn a lot from him. He was a great doubles player and I think my serve and my volley are already better than before. I had a lot of problems with my serve because of my back earlier. I think we’re on the right track and I already see a lot of improvement - during the practices for the time being.” Ági also said that she wants to get into a better shape this year than last year and before. “There are other things as well. In the past, my forehand was weaker than my backhand and it has improved a lot lately, now it’s almost as good as my backhand. My returns have also improved, I had problems with it at the beginning of January. I was asking myself, what’s wrong with me? Then I realised that it’s possibly because I hadn’t played a match for months.” When asked if she can return to the top of the game (she was ranked 13th in April 2008, currently 38th), she immedaitely says: “Of course I can! 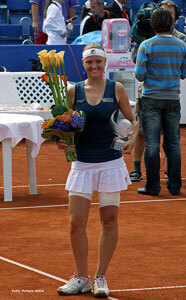 ” Speaking of her 2010 season, she highlights her wins in Budapest and Prague. “Budapest and Prague, the two titles I’m most proud of. Budapest, because it’s Budapest and I was able to defend my title. And Prague, because it’s very rare that a player wins two titles in two weeks. ” Talking about her plans and goals for 2011, she says that originally she wanted to start playing at the Fed Cup and return to the TOP20 by the end of the year. “The first three months of the season are basically gone now for me, so the realistic goal is to get back to the TOP30. With that I could be a seed at the Australian Open next year, and could return to the TOP20 if I had a good result there.